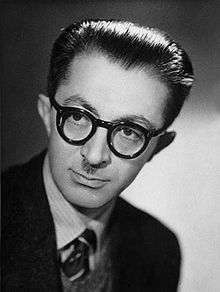 Sadegh (also spelled as Sadeq) Hedayat (Persian: صادق هدایت‎‎ Persian pronunciation: [sɑːdəq hədɑːjæt] listen ; February 17, 1903 in Tehran – April 9, 1951 in Paris) was an Iranian writer, translator and intellectual. Best known for his novel The Blind Owl, he was one of the earliest Iranian writers to adopt literary modernism in their career. Hedayat was born to a northern Iranian aristocratic family in Tehran (his great-grandfather Reza-Qoli Khan Hedayat was himself a well respected writer and worked in the government, as did other relatives) and was educated at Collège Saint-Louis (French catholic school) and Dar ol-Fonoon (1914–1916). In 1925, he was among a select few students who travelled to Europe to continue their studies. There, he initially went on to study engineering in Belgium, which he abandoned after a year to study architecture in France. There he gave up architecture in turn to pursue dentistry. In this period he became acquainted with Thérèse, a Parisian with whom he had a love affair. In 1927 Hedayat attempted suicide by throwing himself into the Marne, but was rescued by a fishing boat. After four years in France, he finally surrendered his scholarship and returned home in the summer of 1930 without receiving a degree. In Iran he held various jobs for short periods. Tomb of Sadegh Hedayat, Père Lachaise Cemetery, Paris. Hedayat subsequently devoted his whole life to studying Western literature and to learning and investigating Iranian history and folklore. The works of Rainer Maria Rilke, Edgar Allan Poe, Franz Kafka, Anton Chekhov and Guy de Maupassant intrigued him the most. During his short literary life span, Hedayat published a substantial number of short stories and novelettes, two historical dramas, a play, a travelogue, and a collection of satirical parodies and sketches. His writings also include numerous literary criticisms, studies in Persian folklore, and many translations from Middle Persian and French. He is credited with having brought Persian language and literature into the mainstream of international contemporary writing. There is no doubt that Hedayat was the most modern of all modern writers in Iran. Yet, for Hedayat, modernity was not just a question of scientific rationality or a pure imitation of European values. In his later years, feeling the socio-political problems of the time, Hedayat started attacking the two major causes of Iran's decimation, the monarchy and the clergy, and through his stories he tried to impute the deafness and blindness of the nation to the abuses of these two major powers. Feeling alienated by everyone around him, especially by his peers, Hedayat's last published work, The Message of Kafka, bespeaks melancholy, desperation and a sense of doom experienced only by those subjected to discrimination and repression. 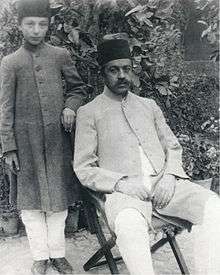 Hedayat traveled and stayed in India from 1936 until 1937, the mansion at Bombay where he was staying during his visit at Bombay has been recently discovered in 2014. Nadeem Akhtar's Hedayat in India  provides us details of Sadegh Hedayat's sojourn in India.In Bombay he completed and published his most enduring work, The Blind Owl, whose writing he started as early as 1930 in Paris. The book was praised by many including Henry Miller, André Breton and others. It has been called "one of the most important literary works in the Persian language." At the end of 1950, Hedayat left Iran for Paris. There, on 9 April 1951, he committed suicide by gassing himself in a small rented apartment on 37 Rue Championnet. He had plugged all the gaps in the windows and door with cotton and, so it would not burden anyone, he had placed the money (a hundred thousand francs) for his shroud and burial in his side wallet in plain view. He was buried at the division 85 of Père Lachaise Cemetery. His funeral was attended by a number of intimate friends and close acquaintances, both Iranian and French. The English poet John Heath-Stubbs published an elegy, 'A Cassida for Sadegh Hedayat', in A Charm Against the Toothache in 1954. In order for the people to be kept in line, they must be kept hungry, needy, illiterate, and superstitious. If the grocer's child becomes literate, he not only will criticize my speech, but he will also utter words that neither you nor I will understand.... What would happen if the forage-seller's child turns out intelligent and capable—and mine, the son of a Haji, turns out lazy and foolish? 1930 Buried Alive (Zende be gūr). A collection of 9 short stories. Rū-ye jādde-ye namnāk (On the Wet Road), unpublished, written in 1935. Al-be`thatu-Islamiya ellal-belad'l Afranjiya (An Islamic Mission in the European Lands), undated. Hedayat's last day and night was adapted into the short film, The Sacred and the Absurd, directed by Ghasem Ebrahimian, which was featured in the Tribeca Film Festival in 2004. In 2005 Iranian film director Khosrow Sinai has made a docudrama about Hedayat entitled Goftogu ba saye = Talking with a shadow. Its main theme is the influence of Western movies such as Der Golem, Nosferatu and Dracula on Hedayat. In 2009, Mohsen Shahrnazdar and Sam Kalantari made a documentary film about Sadegh Hedayat named From No. 37. Acquaintance with Sadegh Hedayat, by M. F. Farzaneh, Publisher: Markaz, Tehran, 2008. Michael C. Hillmann, Hedayat's "The Blind Owl" Forty Years After, Middle East Monograph No. 4, Univ of Texas Press, 1978. Iraj Bashiri, Hedayat's Ivory Tower: Structural Analysis of The Blind Owl, Minneapolis, Minnesota, 1975. Iraj Bashiri, The Fiction of Sadeq Hedayat, 1984. Sayers, Carol, The Blind Owl and Other Hedayat Stories, Minneapolis, Minnesota, 1984. 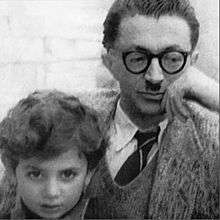 What is left for me from Sadegh Hedayat? Excerpt from "Sadegh Hadayat: Dar Tare Ankaboot" (In the Spider's Web), by M. F. Farzaneh, 2005. Hedayat's last night out in Paris Excerpt from M. F. Farzaneh's "Ashenayee ba Sadegh Hedayat" (Knowning Sadegh Hedayat), 2004. ↑ electricpulp.com. "HEDAYAT, SADEQ v. Hedayat in India – Encyclopaedia Iranica". www.iranicaonline.org. Retrieved 2015-09-03. ↑ Robert Tait in Tehran (2006-11-17). "Bestsellers banned in new Iranian censorship purge | World news". The Guardian. Retrieved 2013-09-26. ↑ "Frieze Magazine | Archive | Tehran". Frieze.com. Retrieved 2013-09-26. ↑ "Iran: Book Censorship The Rule, Not The Exception". Rferl.org. 2007-11-26. Retrieved 2013-09-26. ↑ "Excerpted from Trafic no. 18 (Spring 1996) Translation © Rouge 2004". Wikimedia Commons has media related to Sadeq Hedayat. 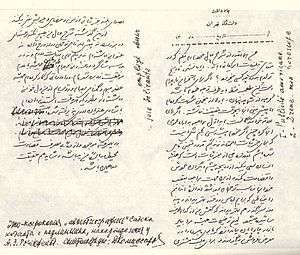 Sadeq Hedayat's Life by Iraj Bashiri. Sadeq Hedayat's Corner, further articles and English translations by Iraj Bashiri. Persian Language & Literature — Sadeq Hedayat. A Tribute to Sadeq Hedayat. Sokhan — online literary magazine (in Persian). 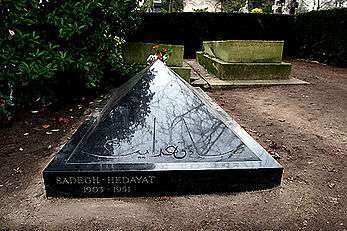 Sadegh Hedayat's Photo & Gravesite. Tup-e Morvari by Sadeq Hedayat (in Persian), (PDF), (The Iranian). Hedayat Family History (in English). Sadeq Hedayat's Heritage, Jadid Online, 17 July 2008 (in English). A Museum That Was Not To Be, by Mahtāj Rasuli, Jadid Online, 20 June 2008 (in Persian). An audio slideshow (with English subtitles) by Shokā Sahrāi, with Mr Jahāngir Hedayat (son of General Isā Hedayat, Sadegh Hedayat's brother) speaking. (6 min 28 sec).